Hawai’i Volcanoes National Park is a destination on its own, a reason you choose to visit Big Island and one of the most fascinating places on Earth. Being here and not seeing the amazing processes that shaped the land and continue to do so is like being in Paris and not seeing the Eiffel tower. Volcanoes National Park will mesmerize you with its beauty and leave you wonder about the origins of our planet and how life began to spread on its surface. A truly unforgettable experience! With this unorthodox introduction, I would like to share our thoughts after visiting Volcanoes NP, what we've seen and why you have to go there too :) I am going to say upfront that this park is a multi-day destination so plan ahead and spare a minimum of two days to see what it has to offer. We've came back for a second day and we regret not having more time to enjoy everything in the park. Hawai’i Volcanoes National Park is one of two national Parks in the state of Hawai’i (other being Haleakala NP on the island of Maui) and Big Island’s most visited natural attraction. Consisting of over 505 square miles of land, the park was established in 1916, long before Hawaii became officially a state. In 1987 it has been given an UNESCO World Heritage Site status. The park encompasses two remarkable mountains- Mauna Loa, Earth’s largest and heaviest volcano and Kīlauea, one of the most active volcanoes on the planet that has been erupting continuously since 1983. Over half of the park is designated within Hawaii Volcanoes Wilderness area, a vast, undeveloped land offering hiking and camping opportunities. 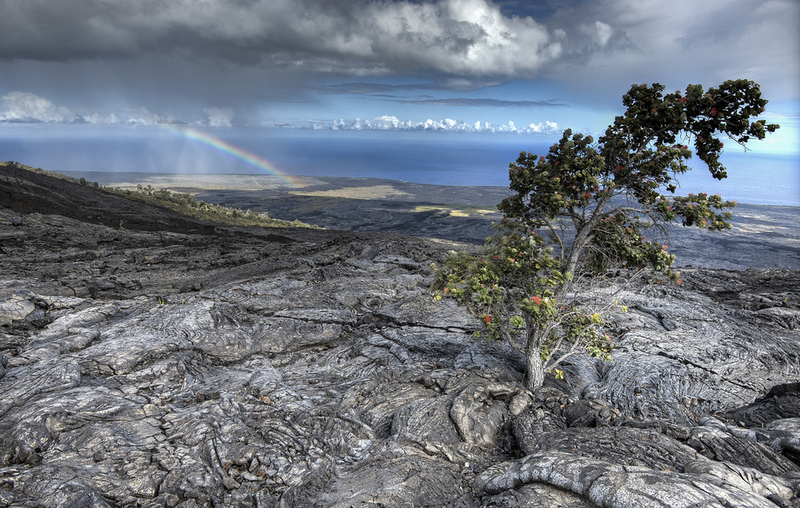 Hawaii Volcanoes National Park is probably the only park on the entire planet that changes and grows its boundaries due to constant land creation fromfrom lava flow. A lot of it- current eruption spills between 250,000 to 650,000 cubic feet (8000-18400 m3) of molten rock daily! That translates to over 500 acres of new land mass created since Kailua started erupting. Interesting fact- all new land created by lava belongs to the state of Hawaii, therefore if you happen to buy an oceanfront property and volcano decides to dump few million tons of rock in your front yard, you can stop bragging about your own private beach (which would be a lie anyway, as Hawaii requires all ocean-front property owners to allow public access to the coastline). Both Mauna Loa and Kilauea are shield volcanoes, a type of volcano formed almost entirely of fluid lava flows. Their shape resembles a warrior’s shield, hence the name. For that reason, Mauna Loa nor Mauna Kea lack the typical cone shaped caldera that shoots lava and rocks from its crater, but rather a smooth, gentle sloped, massive mountain, smoke and water vapor coming from its numerous vents. Shield volcanoes’ lava flow is usually gentle and predictable, but there were events when Kilauea showed its furious side, creating a spectacle of flying rocks and covering everything around in a thick layer of volcanic ash. The last such event occurred in 1959. That segment beings us to a question everyone who plan to visit Volcanoes MP asks: “Will I see flowing lava?” and the short answer would be “It depends”. Conditions at Kilauea change constantly, the site of current eruption called Pu’u ‘O’o may continue to spill lava for decades or stop tomorrow. Nobody can really predict Kilauea’s next move. Fortunately, volcano’s eruption rate has been steady in recent years, so there’s a big chance you’ll see some Earth creation when you visit. Even if there are no surface lava flow at the time you’ll be there, it shouldn't discourage you from visiting Volcanoes NP as it has much more to offer than just glowing red river of liquid rocks. At the time we visited (early June 2014) there was no surface flow and no lava entering the ocean. To check current conditions, visit What's going on with the volcano?. The up-to-date report clearly states if there is access to flowing lava (be aware of shady companies promising to take you to see lava that is non-existent). Hawai’i Volcanoes National Park is located in the remote Ka’ū district of Big Island. To get there, follow Highway 11 to the entrance gate between Mile Marker 30 and 31. The closest town is Volcano Village, just a mile from park’s entrance. We strongly suggest to book a stay there if you’re planning to spend 2 or more days in the park, otherwise you need to prepare for quite a drive to get there (30 miles from Hilo and 100 miles from downtown Kona) Other option is to stay in Puna District (like we did)- it’s around an hour drive to the park. Volcanoes NP is open 24/7 all year round and it costs $10 per vehicle to enter. Keep your receipt as you may re-enter the park within 7 days from purchase date for no additional fee. Main roadway in the park is called Chain of Craters Road and, as name suggest, takes visitors through numerous craters, ending abruptly in the southern part of the park (buried under 10 feet of lava from 1983-2000 lava flows). In addition, majority of hiking trails the park has to offer start off Chain of Craters Road. At the other end, the road loops around Kilauea Caldera- this section is called Crater Rim Drive. Before you start exploring Hawaii Volcanoes National Park, you should check park’s road closures and trails accessibility. Rangers may close sections of paved roads and hiking trails due to toxic fumes coming out from volcano vents (the other reason being some visitors’ stupidity- as it happened with Crater Rim Drive- the road was opened all the way but you couldn't have windows rolled down while driving nor could you stop and get out of the car because of toxic fumes; many people did and one guy went an extra mile- he moved the barrier that blocked parking lot to Kilauea Caldera overlook, parked his vehicle, got out, walked five feet, fainted and had to be rescued by a helicopter). Please, don’t neglect these dangers- fumes from vents create a thick fog blocking the view, which often leads to hikers getting lost. It may also cause respiratory problem and, in some instances, suffocation. Stop by visitor center to get an up-to-date map and volcano activity report. Hawaii Volcanoes NP is a land of diversity, from arid lava deserts to lush tropical jungle, everyone will find something interesting about this place. We have planned for two days in the park, but it turned out that enough time to see everything (not a bad excuse to come back to Hawai’i after all). Since our first day here was right after a long flight from home the day before, we decided to do sightseeing tour and shorter hikes that day and plan for a full day hike on our second visit. Our first stop after paying at the gate was Kilauea Visitor Center, a place to replenish water, get some information about current eruption and ask about planned hikes. We received the most updated trail map at the front gate and used that to fill our day of adventure (because grown people can have adventures too :)). The plan was simple- do a half-day hike in the morning and use rest of the day for sightseeing road trip with stops for shorter hikes. “If you have time for only one hike in the park, do this one”- we read in one Hawai’i vacation guide. It sure is one of the best hikes in the park and one that will take your breath away, not from exhaustion but scenery. This amazing 3 mile (4.8 km) loop hike takes you around the rim of Kilauea Iki crater, descending to its floor and returning back to on the opposite side. Scenery includes a native rain forest, a transition zone where you can spot some hardy plants that first colonized lava from 1959 eruption and finally, a vast lava field. The trail crosses right through the middle of what used to be a lava lake, before it drained into main Kilauea Caldera. To get to the trailhead, turn left immediately after ticket booth and continue on Chain of Craters Road until you spot a sign for Kilauea Iki overlook parking lot. 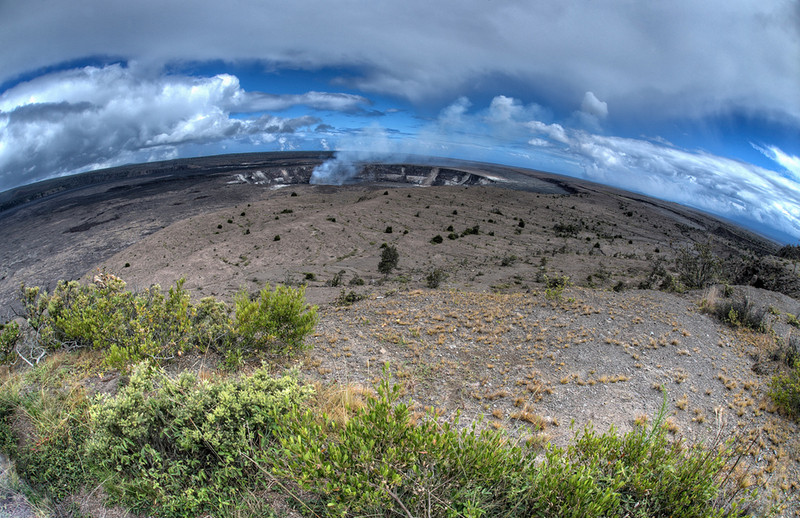 When we got out of the car, first thing that struck our eyes was how enormous Kilauea Crater is. It looks almost like Moon’s craters, minus the vertical walls carpeted in jungle vegetation and steam coming from the depths in several places. Looking closer, we saw ant-sized people walking across the crater’s floor, which fooled us into thinking this hike is going to be long and painful. In reality, the descent is moderately difficult, with many switchbacks to stop and admire the view. At around 1.5 mile, scenery changes, revealing a vast lava field- the bottom of Kilauea Iki crater. It’s unbelievable when you think that only 55 years ago this area was a steaming, boiling lake of liquid rock. Walking across the crater flow is a lesson of volcano geology- different types of lava, as well as numerous steam vents and one lava tube (now collapsed) can be seen and approached right off the trail. 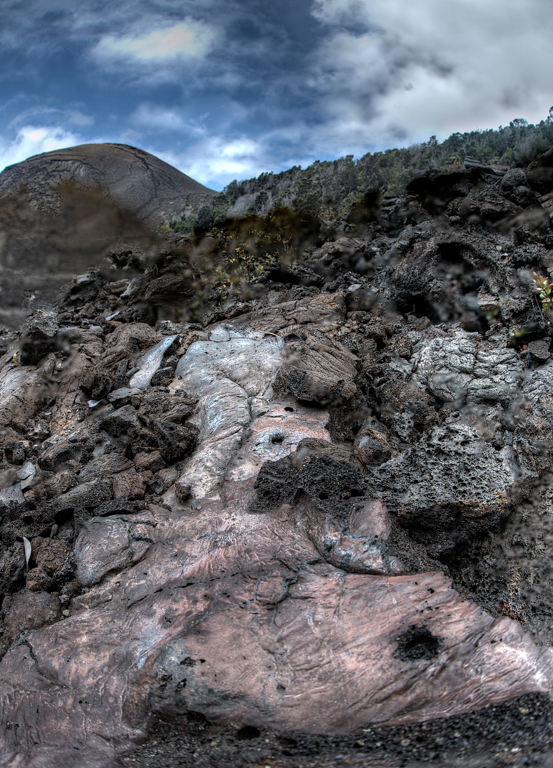 The faint path and lava cairns mark the trail that leads through the entire crater and ascends on the opposite side. That part was easier on the legs and we arrived at the second parking lot in no time. By the way, that lot serves as an overflow parking area for the trail we just did, therefore you can do this hike in reverse if you wish. From here, you can follow the road for another 0.3 miles (0.5 km) to where you parked your car, although the area is also a trailhead to Thurston Lava tube (across the street), a little diversion worth taking while you’re in the area. Thurston Lava Tube, also called Nahuku in Hawaiian language, is a 500 year old natural cave that formed when a flowing lava developed a hard crust on top, then accumulated, thickened and eventually formed a tunnel for the still-liquid lava. When all flowing lava was drained, it left behind a tunnel-like cave. The trail through Thurston lava tube is very short, paved, lighted and very popular with tourists, so forget about being here alone unless you are really lucky. We hiked through the tunnel, popped-out on the other side and walked back to the parking lot, prepared to see more Earth-creating force! The drive along Chain of Craters Road is amazingly scenic and I hit the brakes for an overlook or short hike more often than the time allowed (it was afternoon already and we thought we’ll see most of the park attractions that day, a mistake made by many before us). First excursion revealed itself after a very short drive from Kilauea Iki parking lot, in the form of numerous steam vents shooting clouds of water vapor in the sky. There is a designated parking area with few vents a couple of steps from a parked car. A short hike leads to what looks like a field of steam, obstructing the view and creating a truly magical scene. You can approach these vents closely and even stick your hand to feel the warmth coming out from our planet’s mantle, but be careful as steam can be boiling hot at certain locations. It started raining, making the hot air feel even more pleasing on our damp clothes. Chain of Craters Road is a long drive (18 miles round- trip down a two line road with countless opportunities to stop and explore) and therefore a good afternoon filler. Before we reached the end of the road, the sun started setting, painting the landscape in golden red hues. We passed many dated lava flows (some of them younger than us), each one of them different from the previous. At some point, coastline appears over the horizon and in this very moment we realized how unbelievably powerful the earth-creating force of volcano eruption is. The neighborhood of Kalapana in the Puna District serves as a grim example of how small and vulnerable human beings are in the face of natural hazards. In July 1983. lava started erupting from Kīlauea vent Kūpa’ianahā and by 1986 it reached the town of Kalapana, swallowing everything that was on its path. The “slow-motion” natural disaster completely buried Kalapana under 30 feet of lava, destroying 181 homes, many stores, a beautiful black sand beach and all roads leading to the town. Amazingly, few people still live there despite having a hard time getting in and out of town. We planned our second visit to Volcanoes National Park to be a day of hiking. There are numerous hiking trails in the park, but one stands out as to be a “ see it all” kind of escapade, with an added bonus of getting as close as safely possible to the site of current eruption activity- Pu’u’Ō’o crater. Nāpau is one of Volcanoes longest dayhikes. This out-and-back, 11.8 miles (19 km) round-trip hike leads to Nāpau crater and is currently the only foot path that allows to see Pu’u’Ō’o vent doing its thing ( transferring unimaginably hot magna from the heart of our planet to the surface) from a safe distance. It’s a challenging trek- it passes by undeveloped lava deserts, huge crater rims and disappears among tropical foliage in an old grow rainforest. Bring a sturdy hiking boots, rain gear (it rains a lot in Volcanoes NP), plenty of food and water. Expect fantastic rewards for your effort- steaming volcano vents, lava trees, tropical jungle, massive craters, native fauna and flora, as well as all kinds of lava Hawaii has to offer. It truly is an All-inclusive hike. A couple of precautions- this trail may be closed at times when sulfur gases levels are too high or/and wind pushes them in trail’s direction (there were cases where people got lost in thick volcano gas fog and needed to be rescued). You need a free permit in form of self-registration kiosk at trailhead- don’t forget to sign in and sign out after you return, that way rangers know you were out there and later came back safely. To get to the trailhead, follow Chain of Craters Road until you spot a left turn sign for Mauna Ulu crater. Follow the road to its end and park your car at a small parking lot (that fills up quickly in high-season or so we’ve been told). Arrive early, the entire hike takes good 6-8 hours or more to complete and you don’t want to be walking at night here- it’s very easy to get off the trail in total darkness. You can also opt to complete this hike in two days by staying in a campground near Nāpau crater (permit required, available at visitor center). When I think about it in retrospective, Nāpau trail would be in top 10 hikes I ever did. That is even when I take into consideration the fact that we never reached the trail’s end and returned soaking wet. It rained the whole length of our hike and we were about half a mile short of reaching the campground, but the narrow path in the jungle turned into a rapid stream, forcing us to turn back (a good precaution for the future- take good rain jacket and pack hiking sandals if space in your backpack allows for it). Nevertheless, the entire hike is so amazingly diversified and beautiful even the bad weather didn’t ruin our day (ok, I whined a little bit :)). That was, by the way, the only day of our stay it rained constantly. Hiking the first part of our hike- the Pu’u Huluhulu trail was a breeze and we reach the intersection where Nāpau trail starts in as little as 30 minutes. From here you can continue to Nāpau crater or make a little diversion and climb Pu’u Huluhulu summit. We did the latter, which happened to be worth it as the view from atop is mesmerizing. Coming back to the intersection, we headed towards the edge of forest to be greeted by a vast, moon-like lava landscape, reaching as far as eye can see. From that point, the trail becomes much less developed, you basically walk through lava desert, the only orientation points being cairns (piles of rock arranged to pinpoint the trail). This was the hardest part of our hike, our feet thanked us for the comfort of over-the-ankle hiking boots battling with razor sharp lava rock. I believe this part must be extremely strenuous when walking in midday sun (we had buckets of water falling from the skies instead). As tough as the hike was, lava desert is an amazing place with all the features you read about in Visitor Center- variety of lava formations, including lava trees, lava tubes, lava river banks as well as pioneer plants, steam vents, volcano craters and native birds flying by. The scenery, with all its distinctive feats, is truly amazing to look at.We hiked for a little over 2 miles until the trail reached the rim of Makaopuhi crater. It is a large crater with dramatic, almost vertical walls. It erupted few times in recent history and may do it again anytime. From here, trail follows the rim, offering plenty of viewing opportunities and a good point to stop and refuel. According to the map and phone’s GPS tracking app, it was another 2.5 miles from the edge of Makaopuhi to Nāpau craters. The rain intensified by the time we reached an edge of the rainforest, nevertheless we kept going forward, thinking it will clear up soon. Unfortunately, it didn’t. The path through the jungle is rather narrow and overgrown (with beautiful native plants). This patch is one of only few remaining old grown forests in the park and it’s dated at 150 years of age. We were very close to the campground and rain intensified even more so ankle deep puddles started forming on the trail. It was getting late (constant rain slowed us down considerably) therefore we decided to turn back, worried that we may encounter flash flood conditions if we keep pushing forward. That is where the story ends. Unfortunately, we can’t show you a single picture from Nāpau crater nor the Pu’u’Ō’o crater blowing gaseous clouds in the distance. Despite the fact this hike remains unfinished, we came back to the parking lot with smile on our faces. Nāpau trail has everything Volcanoes National Park has to offer- lava in myriads of shapes and forms, steaming vents, lava trees, tropical jungle, native animals (we even saw a pair of Nene geese flying by on our way back) and a feel of solitude no other trails can match. We encourage you to do this hike, you won’t regret it! Next stop of that day was quite unplanned- we left the boundaries of Volcanoes National Park to visit Volcano Village laundry and check the efficiency of dryers there. An hour later, we were back and set course for what happened to be our final destination within Volcanoes NP- Jaguar Museum and adjacent Kilauea overlook. Jaguar museum is a great place to wait for sunset and learn about the processes that shaped the island of Hawai’i. You’ll find information about volcanoes from all over the world, the different types of lava you’ll encounter in the park and the history of this National Park and its founders. There is also a gallery featuring paintings, photographs and other forms of art made by local artists, as well as a gift shop. We stopped there for a while and bought our souvenir magnet (cheesy, I know, but every time I open refrigerator’s door, memories of places we've seen come to live... and I like to eat, so...). The sun were low on the horizon, time for a show everyone comes here to see. Every night of the year, Pele performs a spectacle of light, fire and smoke. Lava lake inside Kilauea Crater glows with unimaginable palette of reds and yellows, steam and sulfur gases coming from its very center. It is worth to stay in the park after sunset and get hypnotized by this natural phenomenon. Clear skies reveal billions of stars, adding even more magic to the landscape. Even if you won’t be able to see surface flowing lava at the time you visit, to see a glowing red force of planet creation with your own eyes is equally fantastic.